Almost a month after Cyclone Idai slammed into the south-east African coast, the streets of Mozambique’s busy port Beira are “returning to life” as the search for survivors continues in Zimbabwe, the International Organisation for Migration (IOM) said. Freighters and other heavy vessels are once again plying the shipping lanes along the Beira waterfront and beachfront bistros attracted enough business last weekend to cause traffic jams. “The challenge now is shifting to the outlying countryside”, IOM said, pointing to the Buzi River district in the south-west, only accessible by helicopter until last week. As of Monday, the March 14 disaster left 602 dead in Mozambique. IOM would send damage assessment teams there this week and said searchers would drive for hours “on mostly dirt roads”, staying “several days at a time in rural villages”. IOM’s Displacement Tracking Matrix teams have worked through the forested areas of Manica and Macate provinces, assessing the needs of internally displaced people living in temporary shelters. In Beira, schools are relocating internally-displaced families who sheltered in classrooms during the first hours of the cyclone. Last weekend, 50 families were relocated from Matadouro School to the Sao Pedro emergency camp on the outskirts of the city. This was prepared by IOM with assistance from military firefighters sent by the Brazilian Armed Forces. IOM also helped set up a larger settlement on the grounds of the Samora Machel secondary school, assisting in installing a flexible reservoir carrying 30,000 litres of potable water. “My colleagues and I work early morning until evening, seven days a week to help bring water to affected communities”, Antonio, a government installer, told IOM. Close to two thousand eight hundred cholera cases have been reported with six people dying. Thousands received oral cholera vaccine during a six-day emergency campaign, which ended on Monday. 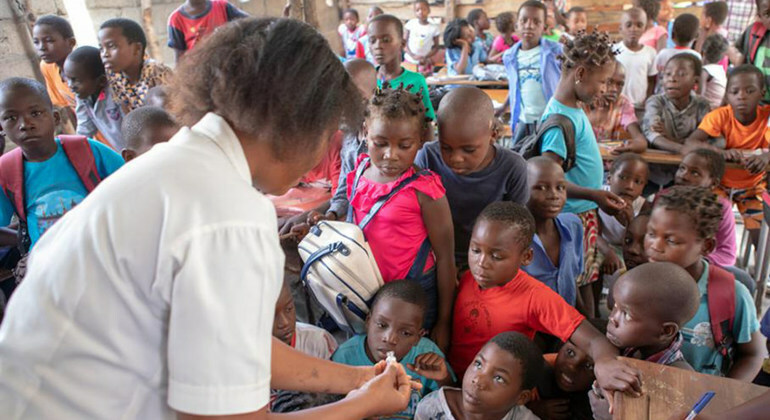 Run by Mozambique’s Ministry of Health, with support from the World Health Organisation (WHO)), UN Children’s Fund (UNICEF) and other partners, nearly 900,000 cyclone survivors were inoculated.